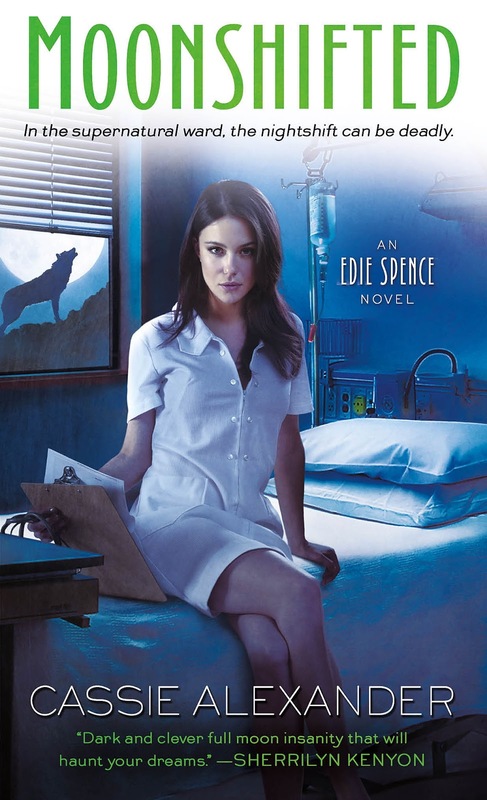 Edie Spence, nurse on Y4, the secret floor of County Central Hospital where the supernatural are treated – the vampires, the werewolves and, in the past, even zombies and dragons. She doesn’t have nearly enough time, especially with the holidays coming up, and even less money hence her taking overtime during the holidays in the hope of more money to pad her rapidly disappearing paycheck. That in itself would be exhausting, but that’s before the king of the werewolves gets run over in a hit and run right in front of her. He’s badly injured to the point of death and even the medical professionals on Y4 can’t raise the dead – but the werewolf politics should he die (and the accusations that fly) are dangerous things to get in the middle of. And then there’s Anna, the vampire she preciously helped and even considers a friend. She has a job for Edie as she prepares to found her own vampire house, a job that requires her to keep a ceremonial knife safe. Whichever is the cause – werewolf or knife –people start trying to kill her, ransacking her home and even risking the wrath of the shadows, the hospital’s mystical protectors, to get at her. And to make matters worse, her drug dealing brother is digging himself into trouble, her parents are coming for Christmas dinner and she has a German Ghostly Cyborg eating her electronics. That was immense fun. I liked the first book, Nightshifted, and found it interesting and pretty entertaining, but Moonshifted is head and shoulders above it. With the beginning of this world introduced, we’re now running with this story in all directions and nearly everything is pretty much excellent. The world building is incredible – there has been such a lot of research that has gone into the various supernatural lores that are relevant in this book – including the 101 ways to make a werewolf which is drawing on some really obscure legends that I had to re-look up and I thought I was pretty overwhelmed with shapeshifter legends already. The way the vampires work, the way the werewolves work – they’re all really really deep and with their own separate twists that add a lot of originality to the story; concepts like the werewolves’ shorter life span (which makes so much sense when described) and the vampire shortage not of human blood, but of actual vampire blood since it takes so long for them to produce. All of these add wonderful new facets to old myths and legends and a completely new spin on everything. But along with the mystical world building which is wide open and growing, there’s also the powerful realities of being a nurse. I love books when the protagonist has a profession and I’m left thinking “this author has worked this job” because it’s so real, they’ve either worked it or really put some sterling effort into making it real. John Hartness does it, Diana Rowland does it and Cassie Alexander certainly does it. It’s not glamourised, it’s not sugar coated and it’s not clean – but the nitty gritty of nursing is there, the good and the icky, the sheer value and importance of it coupled with how undervalued and difficult it is. It’s a really good depiction and makes the entire series so much stronger and more real because of it. What is best about both of these elements of world building is that they’re used appropriately. There’s no massive info dumps and no long monologues. It is shown rather than told, what we need to know is revealed in as much detail as we need to know it. It’s completely restrained and leaves me hungry to know more – like what exactly the Consortium, and Meaty, actually are for one! everything feels natural because the knowledge is presented in a realistic fashion without every leaving us floundering. And the story is fun – it intertwines excellently with Edie’s life but her life doesn’t stop because of it. This is something else I love about this book, in a lot of Urban Fantasy it feels like the protagonist can just put their entire lives on pause while they deal with the plot of the book. Edie isn’t like that – she has a job, she needs money, she even needs the desperate holiday overtime. She can’t just not take those extra hours because the plot has been dropped on her, life goes on. And it’s not just her job – she has family she can’t just drop because dramas are happening, she had her brother and his issues, she has her parents coming round for Christmas Dinner. She can’t cancel all this – and she has to clean up the flat ready for them – just because she has plot drama! Life goes on! Perhaps most impressive to me is Edie’s friend’s – they have their own lives, their own issues and that isn’t subsumed because of Edie’s plot issues. Charles has a thing with werewolves, he’s not setting that aside because Edie is having problems. Gina has relationship drama, Edie can’t just ignore it because of plot reasons – he’s Gina’s friend, she owes it to her to be supportive. Edie can’t just refuse Anna’s plea because it would be convenient to do otherwise. This is such a change from so many urban fantasies where friends just exist to support the protagonist. But aside from twining nicely with both the world building and Edie’s life, the plot is fascinating. It’s excellently paced and written, even with those elements blended into it, the book continues moving forward and never has slow periods. Even Edie having to go buy a couch cover just fits so neatly and adds to the book, these mundane tasks all add something, all develop something and help highlight the relationships without long monologues or info dumps. The mystery behind the injured werewolf king is a curious one. From the beginning I realised that the accused was clearly not the person behind it – it was too obviously a red herring – but I didn’t even remotely predict who was actually behind the attack nor how it all came together with werewolf and vampire politics interlinking. It was really well done, all made sense, and all was a complete surprise. On top of the mystery, the actions scenes, when they arrive, were well written and had that perfect balance of pace versus description. And I love Edie as a character. She’s human. Completely and utterly human without masterful martial arts or great big guns. She can’t fight, in many ways she’s helpless in the supernatural world – but being unable to fight doesn’t make her unable to act. She’s very good at her actual job – healing – she’s intelligent and capable and, beyond intelligent, she’s smart. She’s very cynical, repeatedly refusing to trust people when your average Urban Fantasy protagonist would be merrily tripping along behind them to a gingerbread cottage of choice. She takes precautions, she asks for help when she needs it, she’s not too foolish to refuse to demand protection from the supernatural entities that want her help. She’s dubious, she’s cynical, she won’t even extend the benefit of the doubt to her brother because of the number of times he’s dashed her hopes. She has great ideas, she’s hard working, she’s utterly sexual without shame (and quite capable of having a one night stand, rejecting the guy’s clinginess the next day without wallowing in guilt and self-loathing). She’s also rebounding from a relationship and feels very sad and wounded because of it – but manages to convey that without pages and pages of angst and grief. She also has friends – Gina and excellent, awesome friend who has her own life and her own issues and they banter back and forth excellently. Their friendship feels very real because Gina has her own life and stories – it’s not just Edie. The only negative and I can say about this book is that it is simply awful with inclusion of minorities. Gina, a Latina woman, and a Latino family that has been hurt by a gang shooting are the only POC and there are no GBLT people at all. We’ve had a fairly substantial cast by now of a decent number of characters, I’d hope for more diversity than this. We do have some excellent class commentary. Edie isn’t rich, she lives paycheck to paycheck and constantly works overtime even when tired and stressed because she simply can’t afford not to (not made any easier by the German Ghost Cyborg taking all the electronics in her flat. Yes you read that right. Yes it’s weird and yes it’s awesome). Her brother is homeless and struggling with addiction while she struggles to help him however she can fully aware of his relapses. The drug addiction and the poverty are both treated extremely realistically, with the cynicism and the difficulty they deserve and the full cost and burden they put on the characters is never ignored. I liked the first book, I love this book. Do I recommend it? Definitely – go, buy it, love it. If the first book were awful it would still be worth battling through to get to this one – and it isn’t, it’s great fun as well.